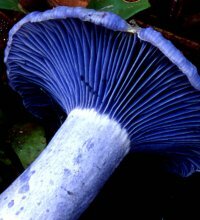 Russulales are often very colourful fungi: the blue Lactarius indigo (see larger picture) is perhaps one of the most striking ones. With the advent of new web technologies and the improved accessibility of this medium to mycologists all over the world, a website seemed preferable over the distribution of a printed document, especially as the website will offer continuously updated and easily searchable databases. The information contained in the databases is still incomplete, but we are working hard to complete this and we extend our thanks to the mycologists who have helped in the past or still are helping with this huge task. To see some examples of what kind of information we hope to offer for species, you can try and click here. This website is no longer the one-man's initiative of the printed Russulales News: it has evolved into a joint effort of an international team of enthusiastic, young mycologists (see 'People'). It hopes to cover all aspects of Russulales worldwide and in the phylogenetic sense of the order: all groups of mushrooms that share a common ancestor with Russula and Lactarius. Indeed, the recent technological progress in systematics confirms the considerable morphological diversity of the various mushrooms that are close to Russula and Lactarius and that are now grouped in the order Russulales (see 'what are russulales'). The mycologists that will keep this website up-to-date, therefore, may have very different interests, these can be with hypogeous as well as with resupinate taxa instead or with the typical agaricoid Russula or Lactarius. It is eventually possible to consult our literature DB, which comprehends to date 1741 books and articles variously related to the Russulales. Joshi, S., Vishwakarma, M.P., Mahar, R. & Bhatt, R.P. (2013) – Medicinally important and edible species of genus Lactarius from Garhwal Himalaya, India. Mycosphere 4 (4): 714-720. Montoya, L., Bandala, V.M., Haug, I. & Stubbe, D. (2012) – A new species of Lactarius (subgenus Gerardii) from two relict Fagus grandifolia var. mexicana populations in Mexican montane cloud forests. Mycologia [IPNI] 104 (1): 175-181. Jurkeit, W., Krauch, F., Hampe, F., Grauwinkel, B. & Albers, J. (2011) – Russula-Forschung in Mitteleuropa III. Drei neue Russula-Arten aus Nordrhein-Westfalen und Niedersachsen (Deutschland). Z. Mykol. [IPNI] 77 (1): 19-44. Donelli, G. (2009, publ. 2010) – Costanti e variabili nel Sottogenere Amoenula. Rivista Micol. 52 (3): 267-277. Last update: 27/12/2010 - 1488789 visits (4032029 pages) since 09/01/2004.